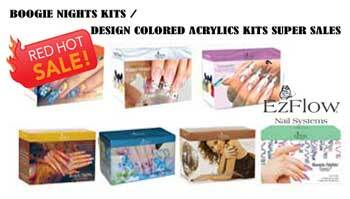 EzFlow Boogie Nights & Design Colored Acrylic Kit Sale!!! Home > Special SALES > EzFlow Boogie Nights & Design Colored Acrylic Kit Sale!!! EzFlow offers sparkling glitter acrylic powder kits. An array of intense glitters and vivid colors are offered ranging from iridescent to metallic glitter. The exciting color combinations are guaranteed to brighten up any nail art or nail enhancement. A Polymer powders paired with Polyester Holographic Film increases adhesion, strength and durability - a dynamic glittery duo that outshines the competition! Can be used with any Monomer, but Q Monomer is recommended for ultimate color and wear. EZ Flow's Innovative Design Team created Design Colored Acrylic Powders that developed a new concept for acrylic nails and introduced them to the nail industry setting us apart from all the rest. Our special blending of the design sculptured powder guarantees vibrant and consistent colors. The wide range of colors allow the technician to put the excitement in doing these fun applications. The colored acrylic powder collections were designed for the nail artist who demands more creativity from her acrylic products.